Are you tired of holiday cookies yet? No? Well, good. 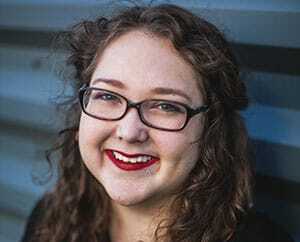 Because you probably shouldn’t be reading this blog. Or any food blog, for that matter. This week anyway. Last week I participated in The Speckled Palate’s annual Christmas Cookie Week with a batch of my amazing (if I do say so myself) No-Bake Avalanche Cookies. And this week I’ve got two more recipes for you. 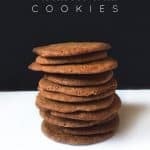 Earlier this year, I stumbled across the Great Food Blogger Cookie Swap, a large-scale, Secret Santa-style exchange of cookies among food bloggers. Each participant makes a batch of 3 dozen cookies to divide among and ship to three food bloggers. In turn, each blogger gets a dozen cookies from three other food bloggers in the post. It’s such a neat idea. One of the worst things about being a food blogger is not living close to a lot of my food blogging friends, making it impossible to taste their treats unless I either travel to their home or make their recipes myself. This cookie swap meant that I not only got to try some amazing recipes, but I also got introduced to six awesome food bloggers. It only cost the price of a cup of coffee to join in, but all the proceeds went to Cookies for Kids’ Cancer by the Childhood Cancer Foundation. Such an amazing cause. Every day during the swap, I eagerly checked the front porch for boxes of homemade cookies. I got amazing Southern Cornflake Cookies from Phillip of Southern Fatty that I could eat for days. (And have.) Julie of Yours Julie sent incredibly luscious Lemon Cardamom Wedding Cookies. And I seriously loved the soft, spicy chocolate cookies from Gerrie of Foodness Gracious. I cannot wait to see their recipes this week so I can try them for myself! Because a dozen simply wasn’t enough. I made three dozen of these Dark Chocolate Pistachio Butter Cookies. I wanted to create a cookie that wouldn’t crumble in the mail. There’s nothing worse than opening a box of crumbs! These are awesome because they are sturdy yet they melt in your mouth when you eat them. 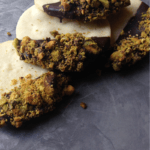 They are dipped in a dark chocolate glaze, then dusted with pistachio crumbles. 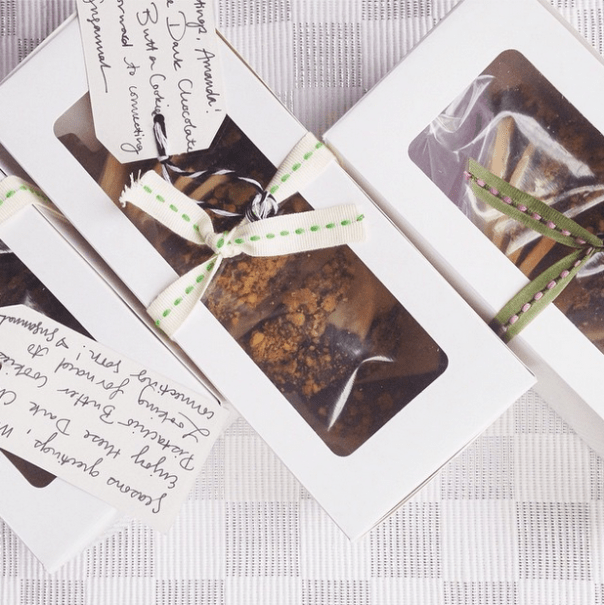 My cookies were shipped off to Meme of Living Well Kitchen, Heather of Shards of Lavender and Amanda of Old House to New Home. I can’t wait to see what these ladies sent their Cookie Swap matches! P.S. My computer crashed last week, and it is sadly going to be in the shop for the next few days. It’s a super stressful time of year for me with pre-holiday freelance deadlines and family coming into town, so please bear with me with any change in my posting schedule and a limited presence on social media this week. Many thanks to the awesome people loaning me computers and support in the meantime! 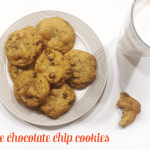 Click below for the Dark Chocolate Pistachio Butter Cookies recipe! 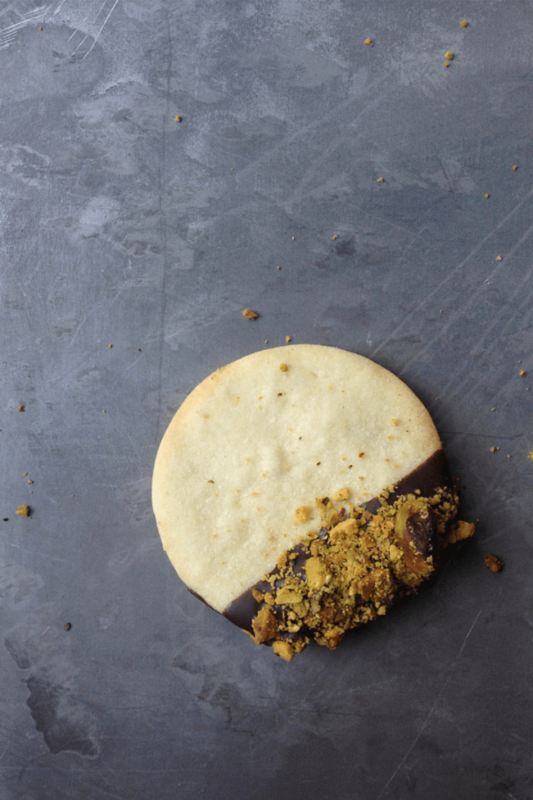 Melt-in-your mouth butter cookies dipped in luscious dark chocolate and crumbly pistachios. Make cookies. Sift the flour and salt into a medium bowl and set aside. In the bottom of an electric mixer fitted with the paddle attachment, mix butter on medium-high speed until just fluffy, about 2 minutes. Slowly add the sugar and mix until smooth, then add the eggs one at a time. Mixing on low speed, add in the flour mixture until just combined. Wrap dough in plastic, and refrigerate until firm, about 2 hours. On a lightly floured surface, roll out dough to about 1/8 inch thick. 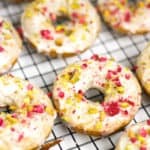 With a glass or round cookie cutter, cut into 1 1/2-inch rounds. Use a spatula to transfer the rounds to baking sheets, spacing 1 inch apart. Bake cookies for about 12 minutes, rotating halfway through. 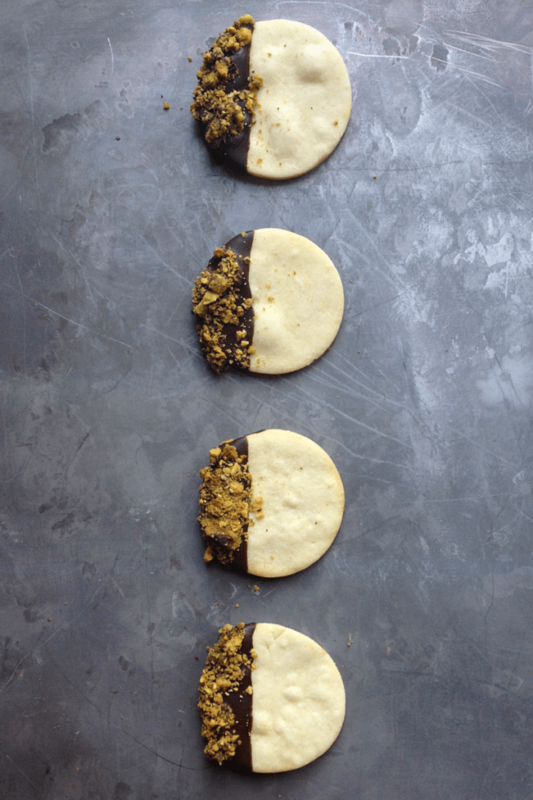 Cookies should be golden on the bottoms and the edges. Transfer to wire racks and let cool completely. Make the topping. In a food processor or blender, grind the pistachios until crumbly and chunky. You don’t want whole pistachios or a fine crumble, but somewhere in between. Transfer to a small bowl and set aside. 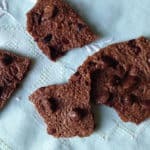 Melt the chocolate in a double-boiler or in 20-second increments in the microwave on low heat. Do not allow to burn. Stir. Dip cookies 1/3 of the way into the chocolate, then gently roll the top in the pistachio chunks. Place on a baking sheet lined with parchment paper. Allow to set in the fridge for 15 minutes. Store in an airtight container. This looks delicious! They’re like little pieces of art! Yum!! 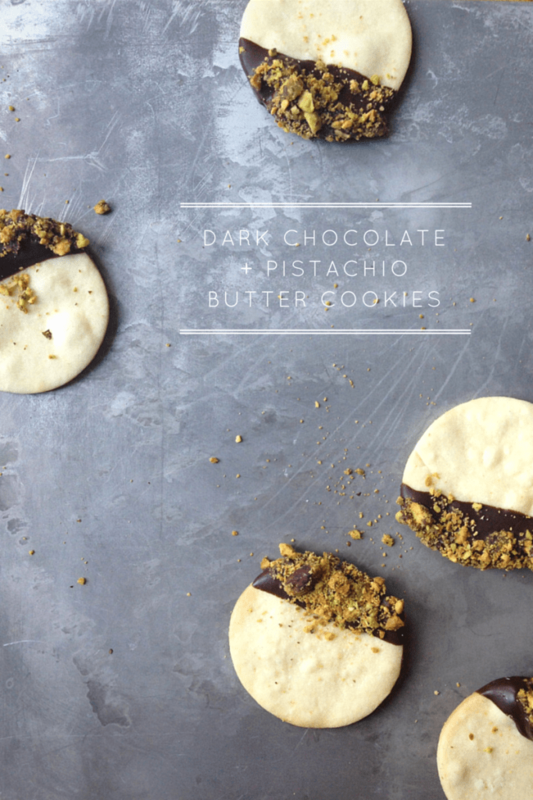 I love the combo of dark chocolate and pistachio. 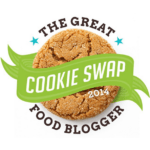 I did the great food blogger cookies swap too. So fun! Oh nooo, it’s the worst thing to live without computer during “busy season”. Hope everything is okay…and no, never get tired of cookies. These look so good! And the cookie swap sounds like so much fun! 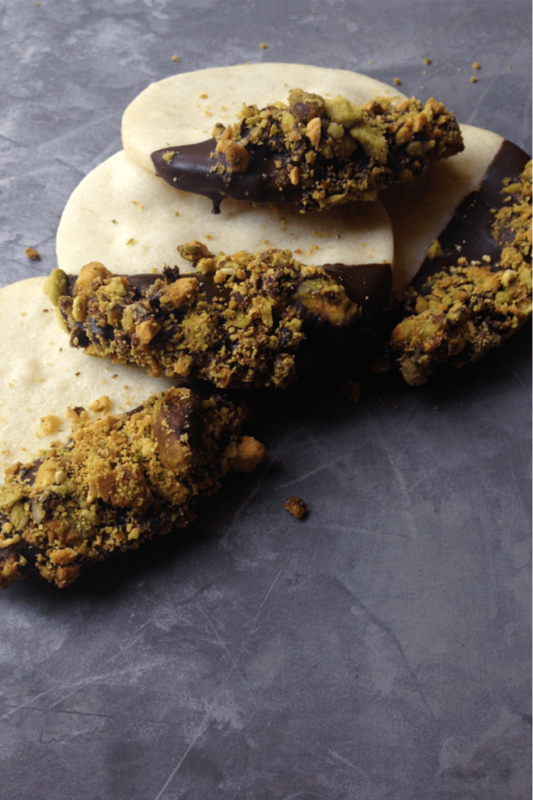 I decided to drizzle them with dark chocolate to dress them up, and since pistachios and chocolate go so well together. I shared these with my Mother, and she adored them. I have to agree, they are delightful! So pretty too with the light green from the pistachios to color them. Naturally colored foods are the best!